Look after the environment while enjoying your morning coffee with this eco-friendly, biodegradable, reusable travel mug. Combining beautiful designs and practicality, it is lightweight and dishwasher safe, in black and white with positive, encouraging thoughts, so you can do a good thing for the environment and look good doing it! This gorgeous Cambridge travel mug has a heat resistant silicone lid and grip, so it is easy to carry and drink on the go - making it perfect for your daily commute. 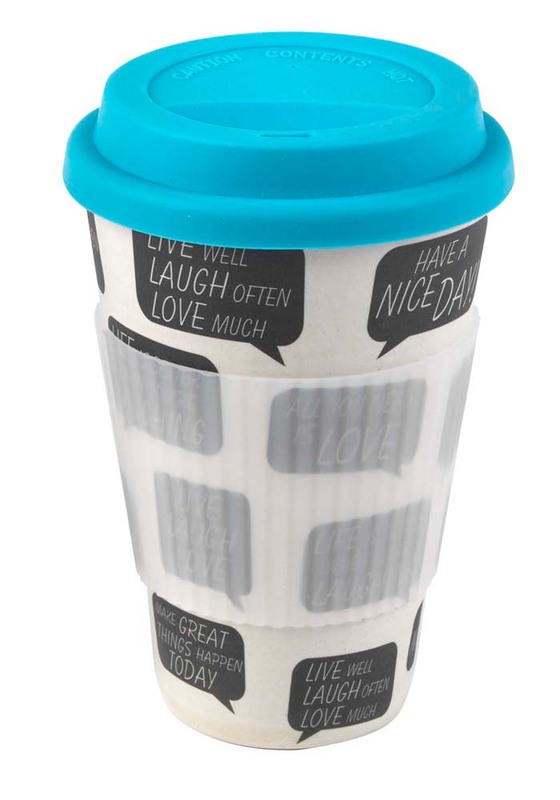 Brighten up your day with this sweet black and white travel mug with a vivid blue lid, ideal for warming up on gloomy mornings. Thinking about the future? This travel mug is reusable and made from biodegradable bamboo, which is great news for the environment.